Steve McAllister, an Australian official for The New Guinea Administration, gets orders to investigate an oil discovery by Ned 'Shark-Eye' Kelly in the interior. 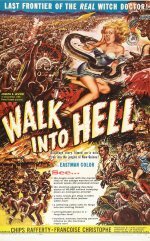 He selects his native policeman, Sergeant-Major Towalaka, to accompany him on his "walk into hell" and then finds that a French lady doctor, Louise Dumurcet, is to go with them part of the journey. They find the malaria-stricken Jeff Clayton in a deserted village and he joins the trek.